This master bathroom was a real treat to work on. The client was really great, the installer was knowledgeable and skilled and the design came together so beautifully. For me, one of the best days on each job is photography day! I love going out, seeing the finished product and snapping some pictures of all the little details to share. I took these photos a few weeks back and I have been working my way through them; I am very excited to share this space with you and see what you think. The space is the culmination of what the husband and wife each wanted, and for the most part, this hubby follows the “happy wife, happy life” philosophy, letting the wife and I bring her dreams to life. However, when the husband saw the shower fixtures available today, he got excited and picked out one of the biggest rain heads around. Just as he fell in love with the shower pieces, she fell in love with the faucets. 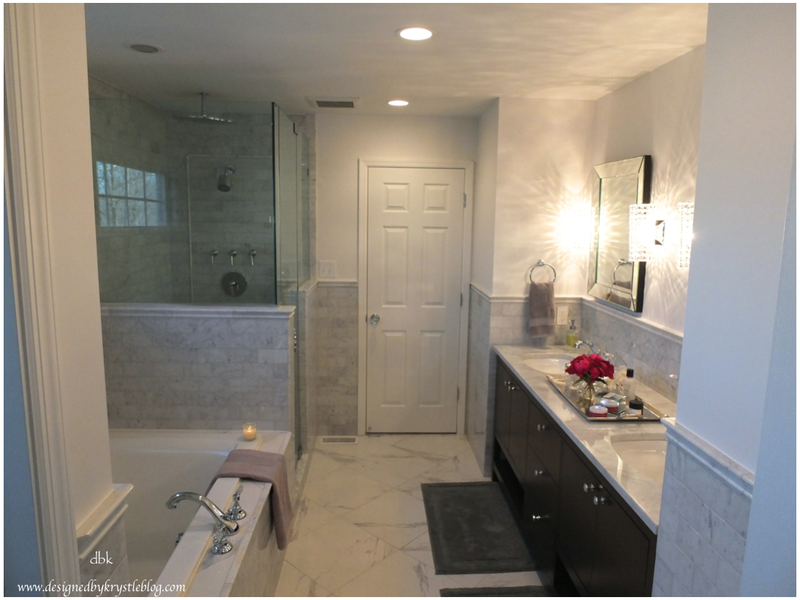 We mixed manufacturers between the faucets, shower controls and shower heads to give Mr. F what he wanted in the shower, while giving Mrs. F the little bit of bling that she fell in love with and blending these elements together in the space as well. The focus in this space is really on all of the Carrera marble, which brings the elements of the space together. For all of the stone work in the space, we used Carrera. The walls are all marble subway tiles, with pencil tiles and chair-rail tiles that are all made of the same marble. We used the pencil tiles to frame out the shower fixtures and the chair rail to cap the tile at 48″ up the walls. The space overall is sophisticated, giving a simple yet elegant canvas for the crystal details to really shine in the space. We carried the crystal through from the faucets to the light fixtures to the door knobs. I’m happy to report that both Mr. and Mrs. F are loving the new space. For more pictures click over to Houzz here, and be sure to follow us there (and here on the blog too) to see all of our completed design projects! Leave us a note in the comments to let us know what you think of the space!